Parents of children with albinism now have access to a one-of-a-kind book to help guide them through the unique challenges of raising a child with albinism. Unveiled at NOAH s 12th National Conference in Las Vegas, Raising a Child with Albinism: A Guide to the Early Years is a 200-page volume containing contributions from close 20 different writers. 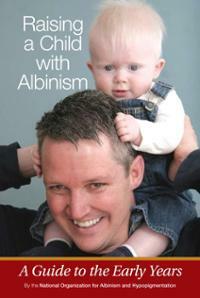 It provides a singularly authoritative source for new parents of children with albinism. – How will albinism impact my child s development? – How do I stimulate my child s vision? Funding for the four-year project comes from Northern Illinois NOAH and a grant from Delta Gamma sorority. The National Organization for Albinism and Hypopigmentation (NOAH) was founded in 1982 to offer information and support to individuals with albinism, their families and the many professionals who work with them. NOAH s mission is to promote public acceptance and understanding of albinism and related conditions, and to encourage research that will lead to improved diagnosis and management of albinism. Use this link to access the book on Amazon.com for your Kindle!